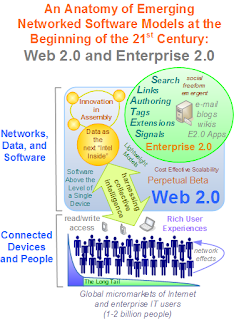 Much ado has been made about the term and concept “Web 2.0”. The many and sundry abuses of the term have led it to be one of the most over-buzzed, over-hyped, and over-rated definitions of 2006. The term has been trademarked, become a conference, and has transcended from a cultural adjective to a business noun. However, as a concept, it is very much alive. In fact, the term has transcended “definition” to become a “movement” describing the ever widening social, cultural, and innovation effects of the internet. Redirecting back to healthcare and the topic of this post, how is the Web 2.0 term and the concept relevant to healthcare? Of interest, there is a powerful “Health 2.0” movement afoot within the industry as indicated by major, game changing reforms being suggested at the White House, Federal, State, and Industry level. Before your “hype dejour” meter redlines, let me convince you that the conversation IS relevant, and that understanding the economics, the competitive imperatives, and the sociopolitical backdrop of the current healthcare reform momentum will help to underscore the role that the type of companies correctly described by Health 2.0 term can play in the process (See an initial listing of “Health 2.0” companies). I realize that attempting to define something currently nebulous, evolving, and inherently “squishy” is challenging, however, after a thorough google search and no clear definition, it is time someone began the process by making an attempt. In other words, and to pay homage to the buzzword compliance police, I am hoping to leverage this medium (my blog) as an “architecture of participation” to tap into the “collective intelligence” of the HITSphere community and beyond. Health 2.0 Company: “Next generation health companies that leverage the principles of openness, standards, and transparency; utilize the technology tools of collaboration, information exchange, and knowledge transfer; and focus on delivering value added services that empower health participants (patients, physicians, providers, and payers) with freedom, choice, and accountability for health outcomes. * I originally called it “Healthcare 2.0” but quickly realized adding “care” unnecessarily narrowed the term. As a physician and founder of PassportMD, Inc. (http://www.PassportMD.com ) , I remain committed to creating a free site and service so that people of any age and any economic status can participate. The free service helps people through the often-tedious process of creating a very valuable, and potentially life saving tool, the personal health record. We are committed to simplifying this process, giving people, seniors, adults, children, particularly with a history of at least one chronic medical disease, on multiple medications, or with a history of allergies access to a system that can help save their lives. Doctors need to have access to reliable information that is legible and accessible and PassportMD provides this needed function. But, this is just a small part of our committment and time, I believe that there is much more to this than simply consumer “owned” phr’s…I wont go into this now..but simply say “stay tuned” as we all watch and hopefully participate in the convergence of technology, business, and healthcare with the ultimate end game of improving healthcare quality, access and cost. Teen Mental Health Blog » Blog Archive » What is Health 2.0?